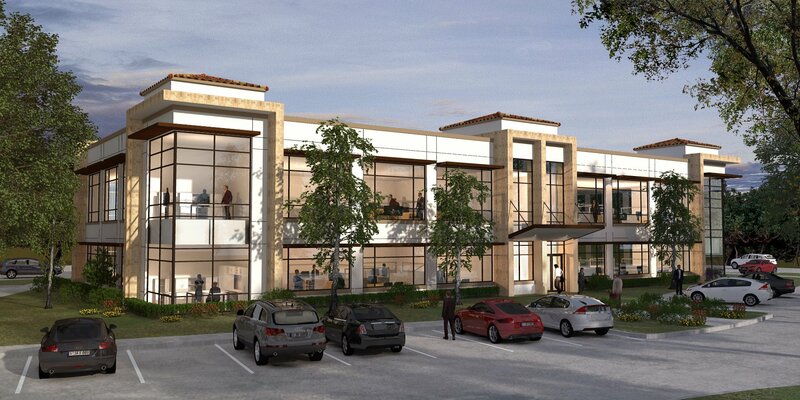 Realty Capital Management has announced the groundbreaking of the Lakeside Professional Office building, a 21,750-square-foot Class A speculative office building located at the southeast corner of Lakeside Parkway and FM 2499 in Flower Mound. BancorpSouth is providing the construction loan, and Realty Capital Management has partnered with Lakeside DFW Land, Ltd. to provide the equity funding. Lakeside DFW Land, Ltd., which is majority-owned by the Peter P. Stewart family of Dallas, and Realty Capital Management have been successful partners in the 150-acre Lakeside DFW mixed-use community, of which the office tract is a part of. Realty Capital Management is also under construction on the $75 million, 16-story, 54-unit luxury condominium tower on Grapevine Lake called The Lakeside Tower. Set to be complete in the summer of 2018, Lakeside Professional Office building is ideal for entrepreneurial businesses or corporate tenants seeking a small regional office. The location offers convenient access to major thoroughfares including FM 2499, Highways 121 and 114, Interstate 635 and minutes to DFW International Airport. In addition to its close proximity to Lakeside DFW, Lakeside Professional Office building will sit adjacent to the newly-opened 7-Eleven, as well as a restaurant-ready pad site. For additional information regarding Lakeside Professional Office Building, contact Archie at 469-533-4131.